A Tile is an image that represents your app on the Start screen. All apps have at least one Tile, known as the default Tile, which displays on the Start screen when a customer pins your app from the App list. Apps can also add support for one or more secondary Tiles—for example, let's say your app displays the current weather of a city on its Tile. By supporting secondary Tiles, your customer could choose to pin a Tile for each city that he or she chooses. Support multiple sizes, customizable by your customer. Choose from one of three visual templates to help your app stand out. Offer a variety of secondary Tiles. Control which page your customers land on when clicking on your secondary Tiles. Never, by using a static Tile that is easily set up through Visual Studio. Programmatically, by using immediate or scheduled local notifications. Programmatically, by using a cloud service with push notifications. 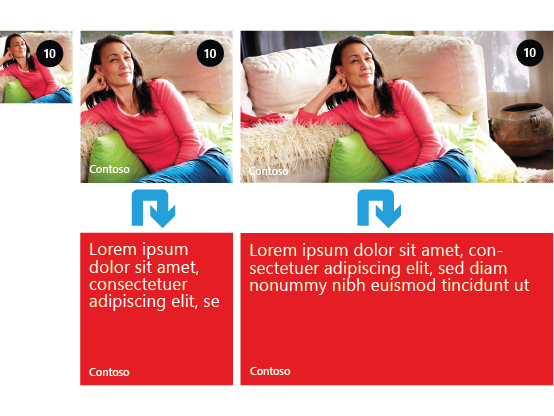 Windows Phone 8 supports three Tile templates: flip, iconic, and cycle. It's important to carefully choose a template for your default Tile, because the template for default Tiles can't be programmatically changed using code later on. You'll have to submit an update to your app if you want to change your default Tile to a new template. Secondary Tiles, however, can be dynamically created on the fly from code using any template you want. The template type you should choose depends on the type of app you build and the design you're going for. For more information about how to choose the right Tile template, see Choosing the best Tile template for your app for Windows Phone. The Tile flips from front to back. This template might look familiar to Windows Phone OS 7.1 developers, because the template is based on the Windows Phone OS 7.1 Tile template. For more information about this template, see Flip Tile template for Windows Phone 8. The Tile is based on Windows Phone design principles. For more information about this template, see Iconic Tile template for Windows Phone 8. The Tile cycles through up to nine images. For more information about this template, see Cycle Tile template for Windows Phone 8. Windows Phone 8 supports three Tile sizes: small, medium, and wide. Your customer chooses which Tile size they will pin to the Start screen, so it's important to supply an image for each size. The exact image dimensions differ according to which Tile template your app supports. The preceding table lists the tile sizes for each tile type. However, in the case of the Iconic template, the images you supply should have smaller dimensions than those given here, so that the counter on the tile is not cropped. For example, the recommended “best fit” dimensions for the small Iconic tile image are 70 x 110 and the “best fit” dimensions for the image of the medium Iconic tile are 130 x 202. For more information, see Iconic Tile template design guidelines for Windows Phone. Windows Phone 8 supports two additional resolutions, WVGA and 720p. We scale the images you provide to work for these resolutions. 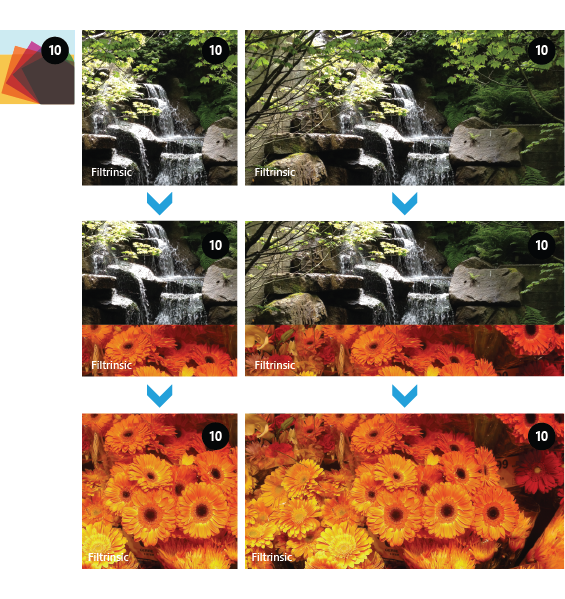 See Multi-resolution apps for Windows Phone 8 for more information about supported resolutions. For more information about Tile sizing for Windows Phone OS 7.1, see Windows Phone OS 7.1 Tile template. Once you've chosen a Tile template to use by reading the Choosing the best Tile template for your app for Windows Phone topic, it's important to understand the best way to design the look, feel and content of your Tile. For that information, see the Tile design guidelines for Windows Phone. The content that displays on your Tile depends on the template you choose and the Tile size. See Flip Tile template for Windows Phone 8, Cycle Tile template for Windows Phone 8, and Iconic Tile template for Windows Phone 8 for more information about the associated Tile properties. Windows Phone OS 7.1 only offers one Tile template, which maps to the flip template in Windows Phone 8. For more information about Windows Phone OS 7.1 Tiles, including sizing and API information, see Windows Phone OS 7.1 Tile template. You can use reflection to display Windows Phone 8 Tile functionality in your Windows Phone OS 7.1 apps. For more information, see Adding Windows Phone 8 and Windows Phone 7.8 Tile functionality to Windows Phone OS 7.1 apps. You can be as simplistic or advanced as you'd like with your Tile. If you don't need anything fancy and don't want to programmatically update your Tile, you can create a basic, static default Tile using Visual Studio. You can update your Tile using local or push notifications. For more information, see Local notifications for Windows Phone 8 and Push notifications for Windows Phone 8.